In a small glass jar with a screw-top lid, combine the vinegar, oil, and pepper. 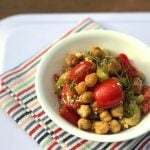 In a large bowl, combine the chickpeas, celery, and tomatoes. Add the feta and dressing and mix well. Run your thumb and index finger down the length of each thyme sprig (top to bottom) to remove the leaves. Add the leaves to the salad and discard the stems. Refrigerate, covered, if not eating right away. Spoon the chickpea salad into serving bowls. Watching sodium? You can cut the sodium in this recipe by about half if you cook your own chickpeas without any added salt. Don't finely chop the celery, leave it in larger (but still bite-sized) pieces for lots of crunch. Any tomatoes will work, but I especially like the small, long marzano tomatoes cut into quarters.